A section of the St. Francis Dam, known as the "tombstone" or the "monument," remained standing after the dam broke on the night of March 12, 1928. To the consternation and embarrassment of Los Angeles water officials, it became a tourist attraction, as seen here by the line of cars. 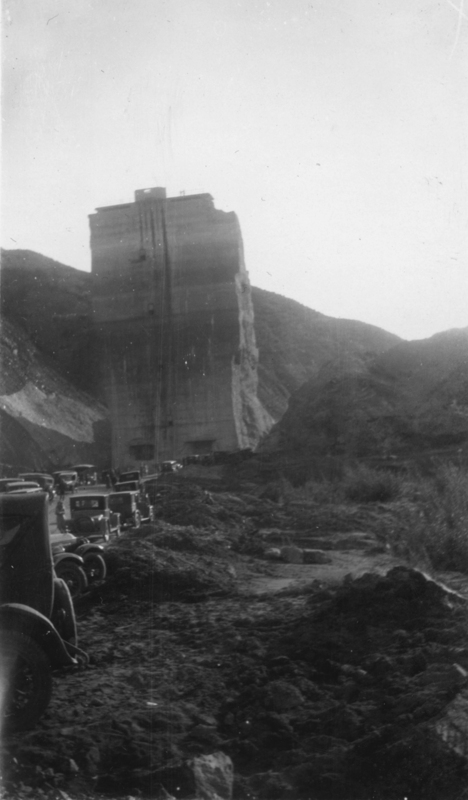 In May 1929, more than a year later, it was dynamited into oblivion after an adventurous young man fell from the top of it and died. South-facing photograph shot by Hetta Laurena Carter a few weeks after the dam break. HC2802a: 9600 dpi jpeg from original print.